Before I get into today’s blog post, I thought I’d give you some more back ground info about myself. My names Clara, I’m 23 and 11 weeks pregnant with our first child. I met Kirsty whilst I was studying a theatre degree at a University just outside of London. I would say the first time I started to consider having a family was about a year before Kirsty and I got married. If you had known me before meeting Kirsty, you wouldn’t have really called me the maternal type. In fact I don’t think I had a maternal bone in my body. This has changed completely . The maternal instinct hit me like a lightning bolt straight out of nowhere. From then on I couldn’t stop thinking about babies and what it would be like to be pregnant. I am very fortunate to have met someone who I love to bits and feel confident enough to start a family with. When we first made the decision to start trying, we decided it would be best if we didn’t tell anyone. Just in case we were unsuccessful. There is nothing worse than having someone ask you every time they see you, if you’re pregnant yet. Or so we thought. In fact in hindsight, we now realise the process is much easier to cope with when you have the support of people you care about and whom care about you. Something I missed most was not being able to talk to my mum about our attempts. Neither myself nor Kirsty told our parents until we decided to use a private donor *which we will cover on a later blog post* There were many nights when we were between donation and the dreaded test day, that I wish I had been able to voice my concerns to someone other than my wife. I think we both took things out on each other purely due to the fact we had no other outlet. The first unsuccessful attempt was heartbreaking. I just remember sobbing my heart out whilst Kirsty kept her emotions under the surface, even though I knew she was just as devastated. If you are going through treatment or are trying for a baby, please don’t feel ashamed about crying. It can be a really hard and emotional process to go through, especially if nobody else knows. After our second failed attempt, I remember walking along the beach with Kirsty and she said “this just wasn’t the right time for our baby, it’s a really special baby and needs some time to get ready for us. So when the time is right, it will happen” Which really helped me get through it. 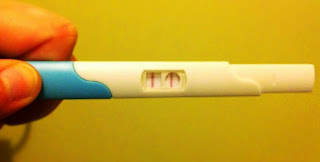 Thankfully on our third attempt, our dreams came true and we were delighted to see two pink lines on our test stick. This time it was Kirsty who was sobbing her heart out. The first people we told were our parents. They were all very happy for us, if not a little shocked. It seems no matter how much you talk about trying for a baby, until you get pregnant people don’t see it coming. I think even we were shocked. To sum up what message i’m trying to convey through this blog post is, It’s easier to go through something with people’s support. Be it friends or family. Than to go it alone.